Creating Your Content Grid (Topic) – How Can We Help? Your Content Grid is a powerful tool within the mLevel application. The content grid allows you to generate the maximum number of questions with a minimal amount of effort. Your content grid is created in Excel, exported as a .csv file, and uploaded into mLevel Studio. Define your Topic - A Topic should be focused around things that have similar and comparable properties. Smartphones have specifications and features, people have biographical information, financial products have rates, fees, and charges etc. Try to avoid broad topics. Each Topic must be unique to your Tenant. Define your Items - You can think of Items as examples of your Topic. 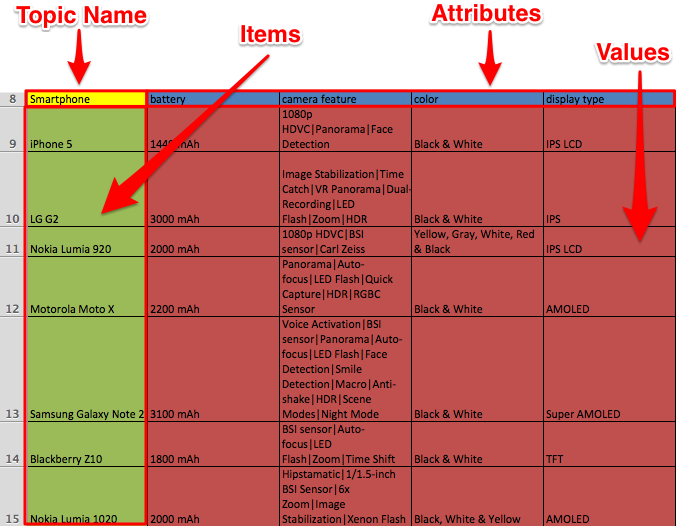 So, if our Topic is '2012 Smartphones', your items could include iPhone 5, Galaxy S III, etc. For more abstract topics, such as a business process or company history, identifying items will be more difficult. Are the items process steps or desired outputs? Are they the key events in the company's history? Define the Attributes - What is it about the Topic items that you want people to learn? Is it product specifications and/or features? Dates of events? Facts about people? Attributes can have multiple fact values. Each Attribute must be unique to your Topic. Fill in Values for every Item/Attribute combination - Once the Items and Attributes have been defined, filling in values for each fact should be fairly straightforward. Try to have at least 6 unique values per column/attribute. Q: What is the character limit within topics? A: 80 characters or less (including spaces) for Topic name, Items & Attributes. Q: How do I include multiple values for an Attribute? A: Use the pipe symbol | to separate values (see above example). Q: Can I include blank cells in my Topic? A: Yes, not every Item/Attribute intersection needs a value. Q: How do I include additional wrong answers? A: Wrong answer are pulled from the grid but you can create additional wrong answers by adding a blank row at the bottom of your Topic grid. Q: Can you have multiple Topics within a Mission? Next, see Defining Question Templates. Attached you'll find some example topics, as well as a blank sheet to help get you started!